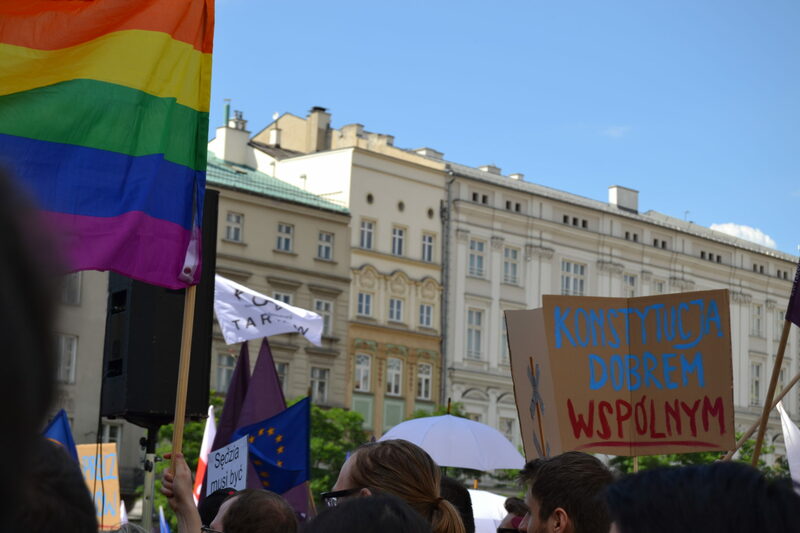 Massive crowds of demonstrators organized today in Warsaw outside parliament as well as in other major Polish cities – Krakow included. 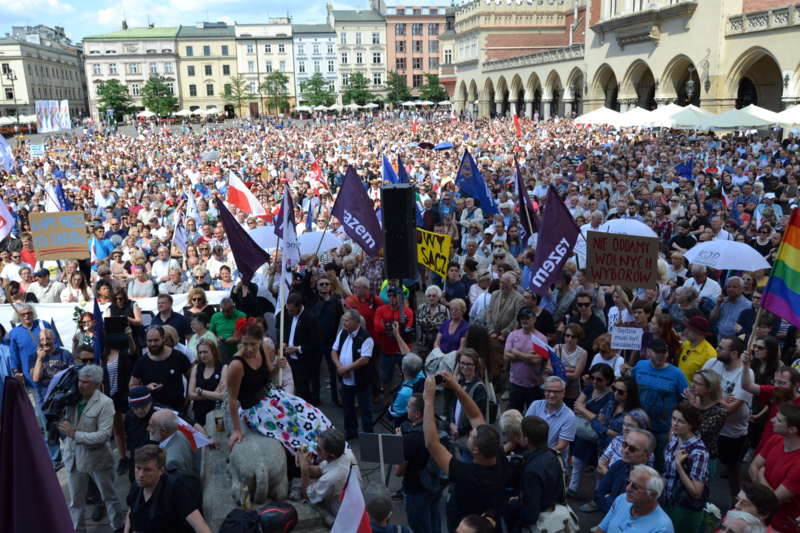 They were protesting the latest controversial action by the ruling Law and Justice party (PiS), who, without prior consultation, passed a bill on Sunday to reorganize the Polish Supreme Court. Specifically, it would allow MPs and the the Minister of Justice to appoint judges, bypassing the consultation of judicial circles. The bill would also give the judiciary council, a body which will have almost all of its members chosen by parliament, the power to choose future appointees. Furthermore, the day after the bill enters into force, the sitting Supreme Court judges would be obliged to resign – giving the government the opportunity to replace them entirely with members of its choosing. Critics, including European Union leaders and the political party Razem, say that this will spell the end of judicial independence in Poland. 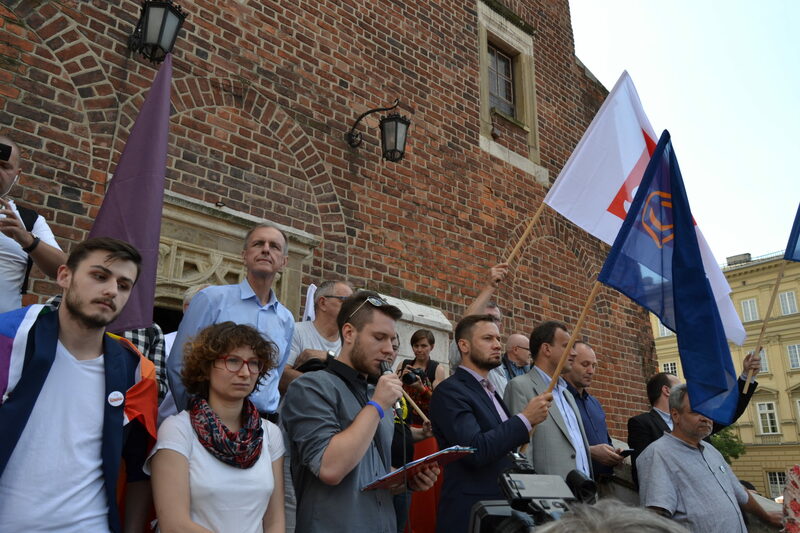 Razem organized the protests alongside several other organizations, including fellow party Nowoczesna and PiS opposition group Committee for the Defense of Democracy (KOD). The bill still needs to be signed by Polish president in order to become law. However, nothing at the moment suggests that President Andrzej Duda plans to veto it. The government justified the move by claiming that the present judiciary is corrupt and reform is needed in order to make it more efficient and democratic. PiS leader Jarosław Kaczyński has called the current judicial system a continuation of its communist predecessor and has therefore insisted on radical change. Judging by the size and diversity of the protest crowd, it might be working. Robert, a local 51-year-old engineer, said that this was his first demonstration in the 27 years since communism ended in Poland. “I was much younger then,” he laughed. But he said it was wrong to compare the current situation with those days. “Now it is more dangerous. Very, very dangerous. Communism was part of external control by Russia. But [PiS] is an internal thief of law. “My position is very simple,” he said. “PiS wants break the Constitution.” Robert considers himself a political independent, but he fears that Poland will become “like Russia, Belarus, or even North Korea,” where citizens are technically permitted to vote in elections that are rigged in favor of one autocratic party. Also concerned were Milena and (another) Karolina, pictured above – both 24, both recent Law graduates of Jagiellonian University in Krakow. They agreed that this was “the most serious” of the controversial moves PiS have made since achieving their majority in 2015, including changes to the structure of the Constitutional Tribunal (which rules on the constitutionality of state actions) and the Polish state media (which the women described as “post-truth propaganda”). Poland’s political future aside, Milena said she was “scared” for her personal career aspirations of being an independent judge. Maria Rola contributed to the translation necessary for this article. This spells the end of the communist era judiciary in Poland. Not even one-party rule as much as one-person rule. The French revolutionaries, and particularly the ‘incorruptible’ Robespierre, also wanted to ditch everything that had gone before and establish an entirely new and virtuous system. Did Polish voters vote for PiS in the last election or for Mr Kaczynski himself? An article of mine about Edward Raczynski appeared in the print edition of the Krakow Post some time back. Raczynski, for those unfamiliar with the name, was one of the greatest Polish statesmen of the 20th century: ambassador to the United Kingdom, later both foreign minister and President of the government in exile. Ardent patriot, he was also a committed European. I wonder what he would have made of developments in his beloved Poland today. At his final resting place in Rogalin is written the following motto: “nie zmarnujcie niepodleglosci”. Since the above comments were written, the chairman’s appalling outburst in parliament has demonstrated that he is quite unfit to be in politics, let alone be running the country. His party should replace him as a matter of urgency for the good of the nation. I write this not as a Polish traitor, but as a concerned outsider whose parents were Polish. The end of the communists judges and their dictate! 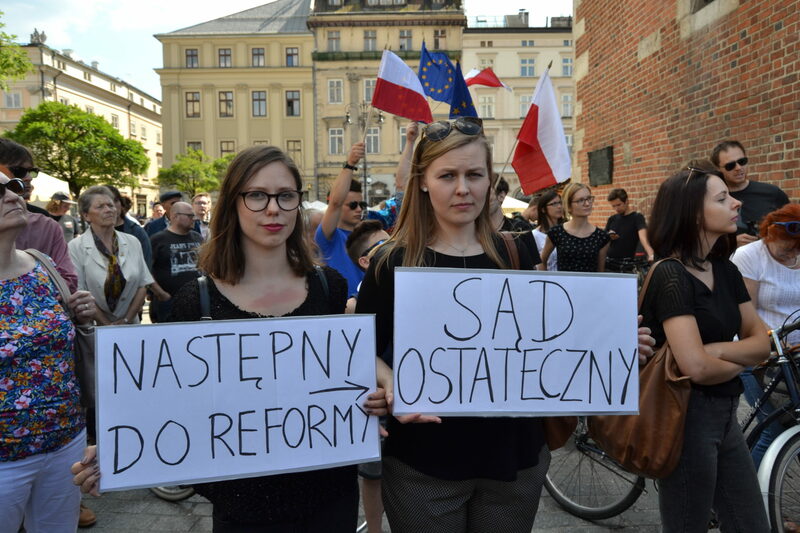 All those protesting are against needed reforms, they want to devastate Poland! Yes, Razem. The far-left socialist party pushing for redistribution and other policies that are very reminiscent of communism. Why are all the articles on this issue so one-sided? Lies. This is about not letting PiS destroy separation of powers. PiS wants to take over courts too. Oh, and the “communists” in the courts? Average age is 35 years old. They were 5-6 years old in 1989. Those damn 6 year old communists! Typical troll. How much do you get for writing this stupidity? Commies on the streets of Poland fighting against democraticly elected government. You must be Kaczynski’s mystery bro! The ruling party lied about Kaczynski’s role in new government claiming he won’t be interfering with decisions. This is why PIS won. If you think having the prime minister and the president posing as marionets is democratic, then you must be knocked on your head. It’s about time to challenge and reform the law in Poland established by the former communist regime!!! Poorly written article (and even more poorly translated into English), obvious biase with a liberal (read: Leftist) slant. Not even one oposite opinion presented here. Typical linear thinking. Looks like a propaganda piece, I find no substance here whatsoever! For people like me who are poor in this government and this president Mr. Duda is ok for those who do not know how to part with the trash they are bad guys. Until now, those people who manifested stolen Poland and sold all state-owned enterprises for nothing, so what are they afraid of? Finaly Poles have chance to say goodbay to KGB agents and thier children who for many years enslaved Poland. i tottaly support new changes agins the old corrupt comunist establishment. they rebranded themselves as thouse whonfight for freedome whereas what they really want is to preserved their privileged position. De-communization of judges that should have been done back in 1989. Of course a caste that thinks they are above rest of people will try to organize a protest using useful idiots to stop it. Finally – post communist justice system comes to the end.,, Protesters ” do not have a majority Polish people support, so – good change r coming. Little minorities protest against well needed and expected changes to the judicial system that has been unchanged since the communist era. Minorities that are linked to very noisy opposition. Most people had voted for the PiS party becauae they expect that kind of changes. and even more will vote in next election. That sort of articles are biased and moreover spread lies to people thst have no clue what’s going on in Poland. Poland is a conservative Catholic White-European utopia and will remain that way thanks to our glorious leaders Duda and Trump. And to all of you atheist/feminist/muslim/gay expats who buy into this left-wing propaganda on ‘Krakow Post’ then speak out against our democratically elected government and try change our culture: you should consider going home to your countries of origin now before you get deported. Most Polish Americans -including me and my wife- support PIS- this is a good Government and wise Government- they try to get rid of post communists who ruined Poland. Judical system is corrupt and needs radical changes. People protesting against these changes now are against the good changes in Poland. Please get your information from different sources and you will go the right way !!!! Nobody who really knows what PiS is about will support them. Old communists, generally speaking stupid people, led by single old man without even a bank account. Constantly lying about Smolensk tragedy and pretty much everything else. Poland needs many reforms and new laws but not generated by PiS, totalitarian party. If you love this Government so much why won’t you leave US and go back living in Poland. If not then I suggest you shut your trap! Young student miss comunism when all its free.It will be 500 new Jobs in court. Do you smell Soros? So do I…the Poles want to be part of the European Union so it can get access to NATO protection against Russia, but they do not want to play the globalization games that Merkel and her EU banking official friends want to play (debt for austerity scams to destroy the middle class, acceptance of millions of refugees who probably do not care about Poland or anywhere else, etc) . But the Poles cannot have it both ways. Now it seems as if the PiS party is trying to protect itself from the vote rigging games that the EU likes to play (look at our friend “Macrony” in France) to get the people they want in power. Once in power, they keep them there through black mail or bribery / kick backs.I presume the PiS is trying to centralize power so it can get rid of the corruptibles within Poland that the EU can use to undermine the PiS. But I see where this is going…https://www.youtube.com/watch?v=bmDXPiAUpGg, They either will do it by more peaceful versions of Ukraine forms of subversion, to an all out coup. This is what happens when you piss off the ritual pedophiles who work in the glass tower of Frankfurt. If PIS survives, kiss Silesia goodbye.